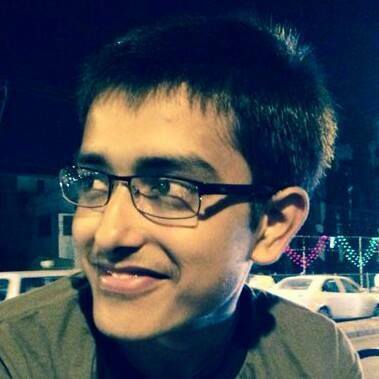 With all new features laid by iOS 8 it has altered two commonly used APIs in UIKit framework. The UIActionSheet and UIAlertView classes used previously have been replaced by the UIAlertController class. So instead of using these deprecated classes you may now move towards using the UIAlertController. 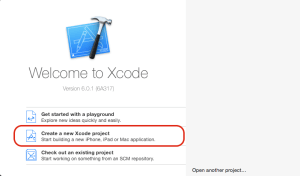 Open Xcode and select "Create a new Xcode project". 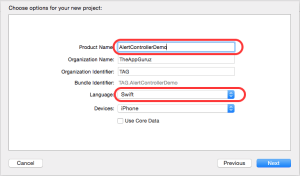 Name the product as AlertControllerDemo and provide rest of the information and do notice it’s in “Swift” language. Once done press next. The main files of generated application are shown in which we will write code to work with UIAlertController class. 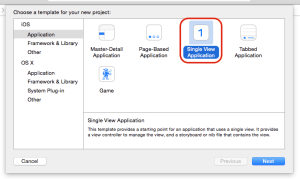 Now open the storyboard and create the user interface as shown. We have two buttons and a label. 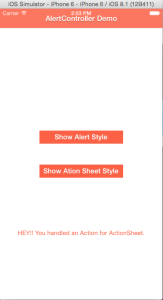 Name the buttons “Show Alert Style” and “Show Action Sheet Style”. 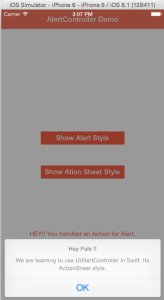 We will use the first button to show the alert style of UIAlertController and the second one to show ActionSheet style of UIAlertController. The label is used to display message which would be result of the actions handled by us when user interacts with buttons on AlertView and ActionSheet. The first method is used to create the reference of UIAlertController with various parameters. 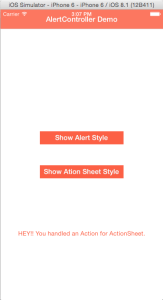 Do note the parameter” preferredStyle”, it determines wether to show an Alert view or an ActionSheet . 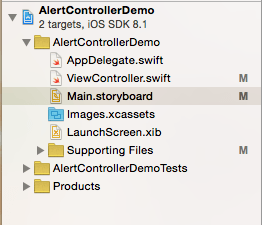 The next method is used to add action to our UIAlertController object. 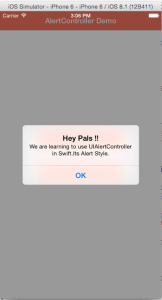 Add the UIAlertAction object to our UIAlertController object using the “addAction” method as discussed above. The only change is we have changed the “prefferedStyle” parameter to be “.ActionSheet”. That’s it. No delegates and nothing more our app is ready. • Result of tapping “Show Alert Style” button and “Ok” button on AlertView being handled. 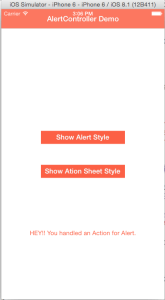 • Result of tapping “Show Action Sheet Style” button and “Ok” button on ActionSheet being handled. I am an iOS Developer and I Personally believe that Mobile applications are the best ways to convert your innovative ideas in to reality in quickest way and help people make their life a joy with technology.